In 2004 the U.S. Coast Guard modernized their ice rescue program. 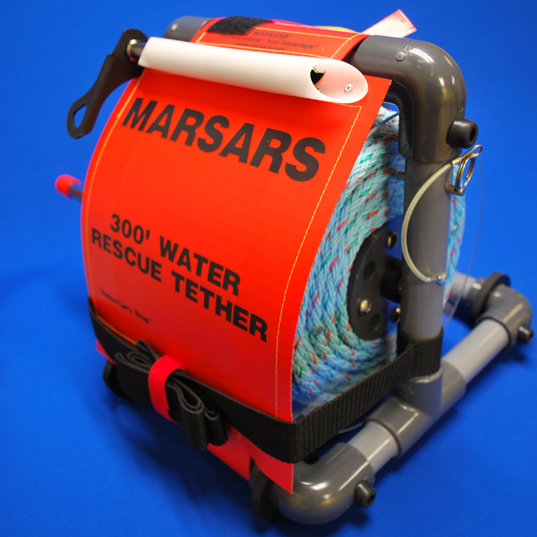 With a primary goal of rescuer’s safety, the MARSARS® Ice Rescue Safety Shuttle Sled (IRSS) was selected as the Coast Guard’s ice rescue rescue device of choice. This sled is now distributed World-wide. 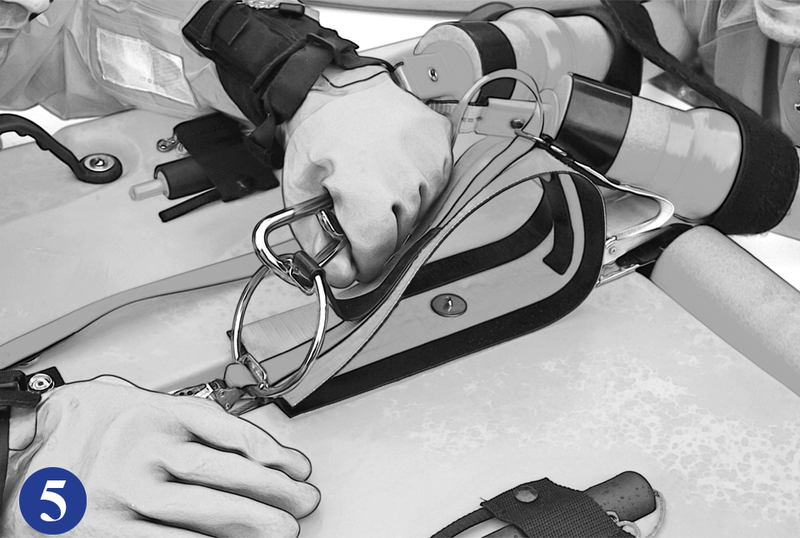 We believe the ease of extracting the patient and rescuer safety has been the primary reason for its popularity. 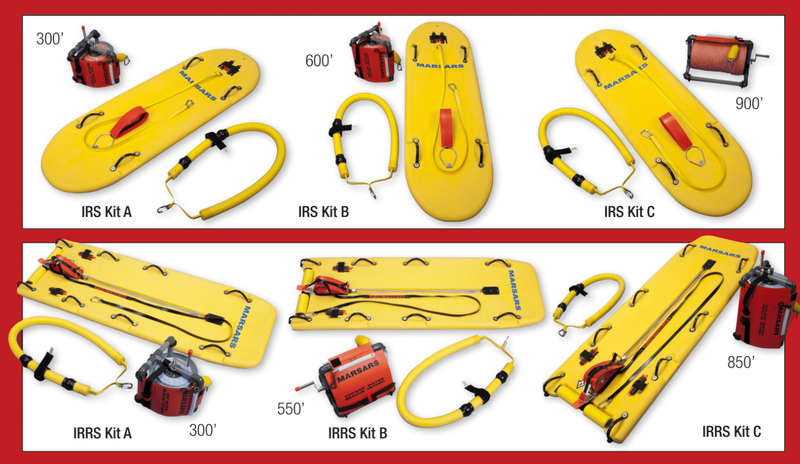 The MARSARS® Ice Rescue Sled kit includes: IRSS Sled, buoyant Cold Water Rescue Sling and your choice of 300’, 550’ or 850’ Ice Rescue Reel. Prior to late 80’s, if grabbed and climbed on, all lifeguards were trained to escape by submerging their body deeper. Doing so, the panicked victim, desperate for support would let them go. Since then, all lifeguards stop at a safe distance and extend a rescue ﬂotation device (RFD). The use of RFDs has become the nucleus of swimmer’s safety in open water rescue. However, if an ice rescue technician is grabbed and climbed on, the ice rescue suit’s buoyancy prevents escape, leaving our techs no recourse but to make aggressive moves to escape. 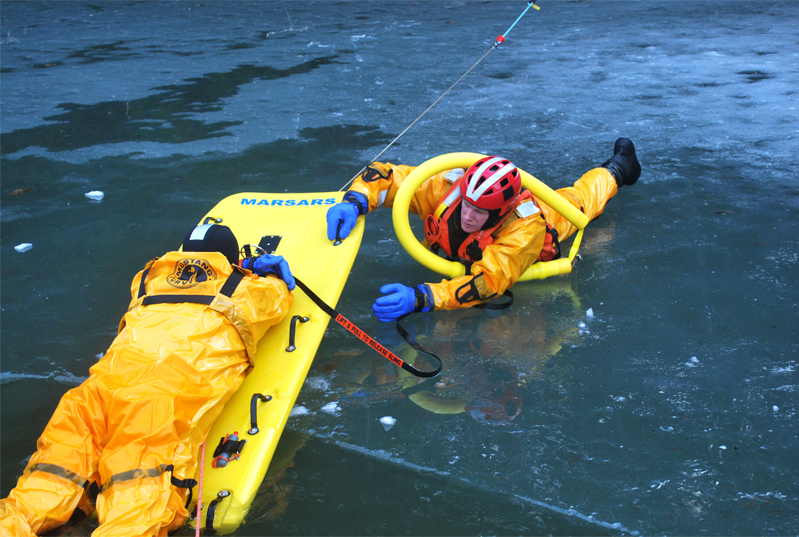 In this high-risk low incident environment, the MARSARS® Ice Rescue Sled (IRSS Sled) is the first ice rescue device designed to gently extract the victim from a safer distance. As first responders, we must be mindful of the rescue dictum: Self-Rescue, Reach, Throw, Row, Go. 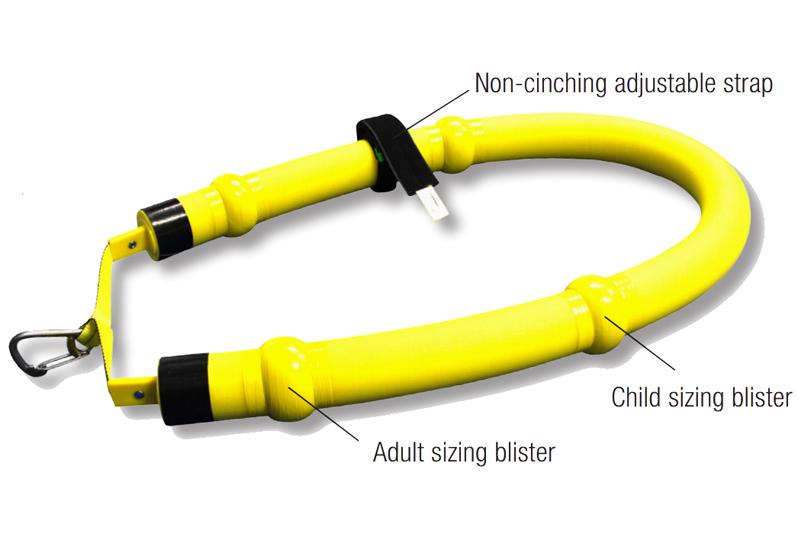 The self-rescue, reaching phase of this principal has been incorporated into the design of this unique mitigating device for high-risk situations. Atop ice during rescue, an outbound ice rescue technician stops one sled length away from the victim and dismounts. 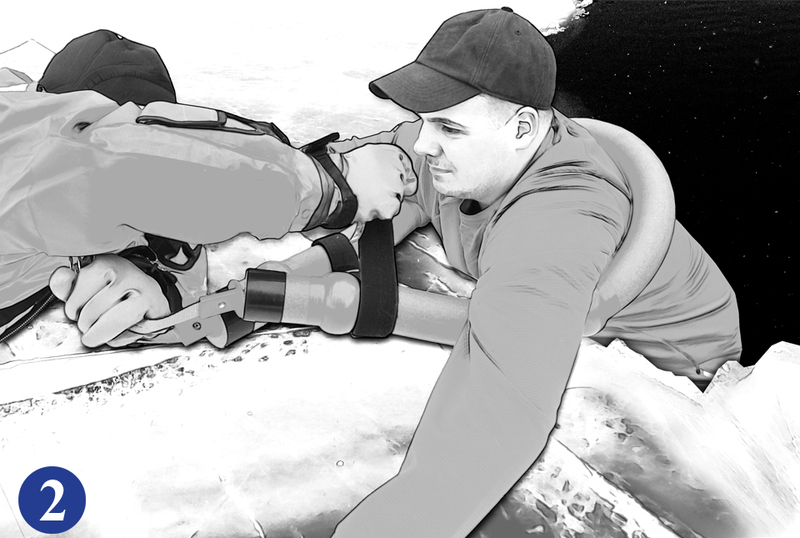 Asking the victim to raise and lower one arm will determine the victim’s physical ability to assist in his own rescue. 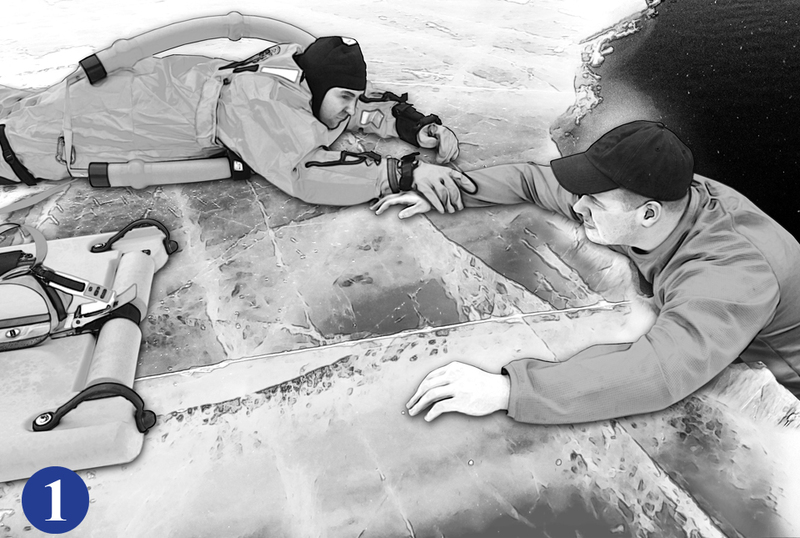 If the victim is found to be physically able, the empty sled is extended as a reaching device for the victim’s self-rescue attempt. The rescue tech directs the victim to insert both forearms completely through the sled’s orange colored forearm sling (VFS). 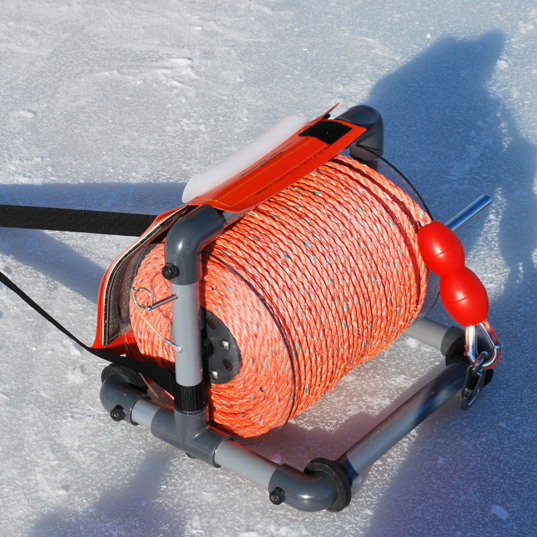 This VFS sling is connected to the sled’s 4:1 ratio pulley system. Next, in quick succession, the brake that held the sled’s forearm sling in place is released, the shore-based line tenders are signaled to start pulling and the inbound end of sled is quickly lifted. On thick ice or during training, with the shore-end of the sled lifted, the rescuer pushes two thirds of the sled off the ice mantle and into the water. On thin ice, there is no need to push this device into the water. The patient’s weight will cause the sled’s tunnel-shaped hull to break the unstable ice mantle and lower. 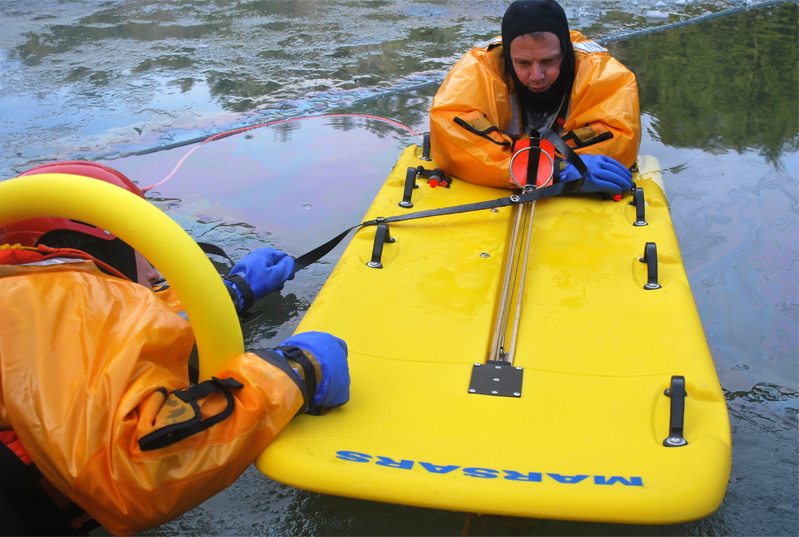 In both instances, the patient’s torso is gently extracted horizontally onto the partially submerged sled. 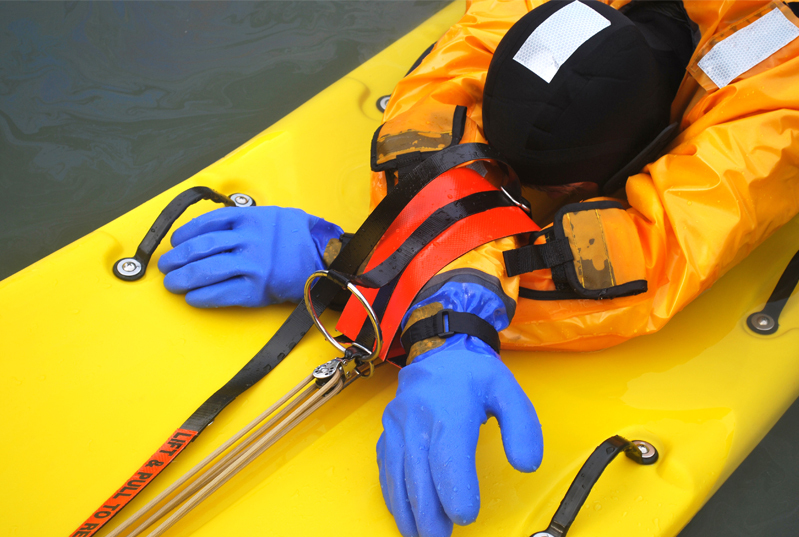 If it has been determined that the victim is unable to assist in his own rescue, the immersed person must now be outftted with the Cold Water Rescue Sling that is part of this kit. To don the sling while atop the ice mantle, the rescuer leaves the sled in place and makes a cautious approach to victim. Upon contact, the victim is outftted with this buoyant ﬂotation device. Next, in rapid succession, the technician pulls the sled within close reach, releases the sled’s VFS brake, attaches the patient’s sling to the sled’s built-in 4:1 ratio pulley system and signals the rescue-based personnel to commence the extrication. If on thick ice, the sled must now be partially submerged. 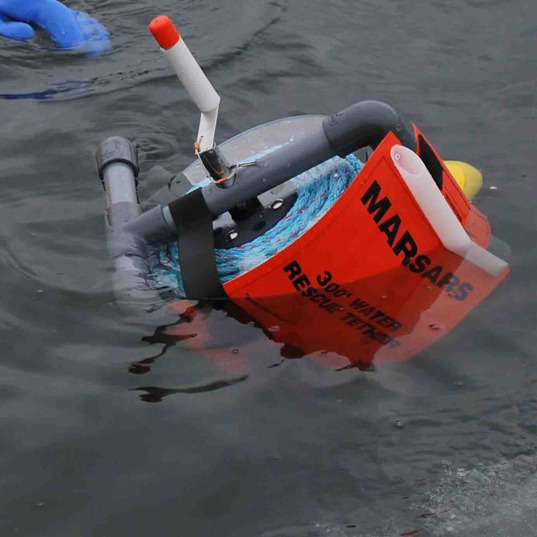 This is accomplished by grabbing the second handle from sled’s roller end and simultaneously pulling the sled into water, as the shore based personnel gently haul the patient aboard the partially submerged device. Returning sled shields torsos of both patient and rescuer. 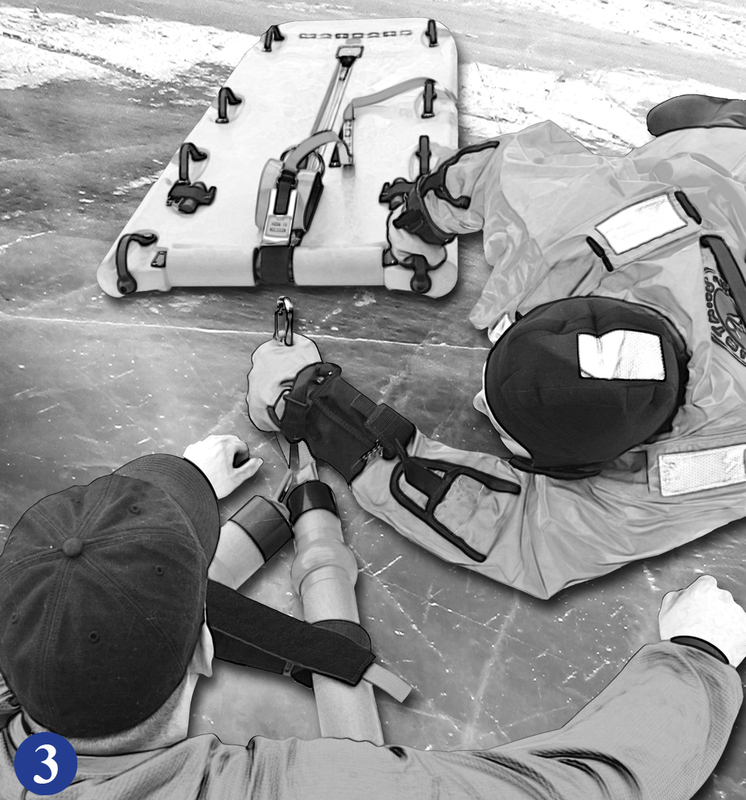 Improved rescue safety with minimal patient handling and physical stress is the result of this well thought out ice-to-ambulance extraction device. 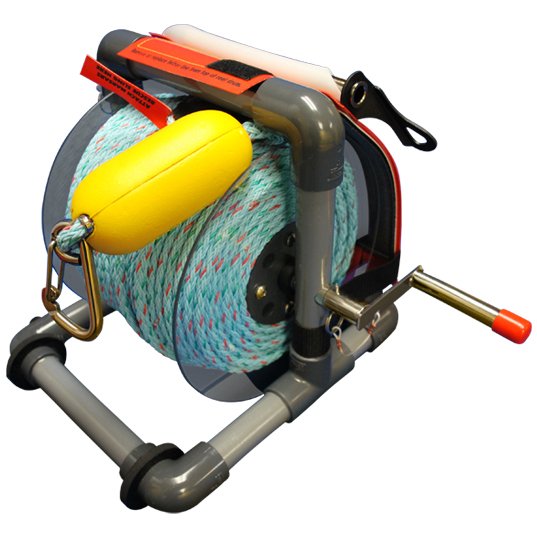 For those seldom if ever life-or-death situation that requires disconnection, a buoyant hook float has been added to keep the disconnected tether hook afloat and ready for re-connection. 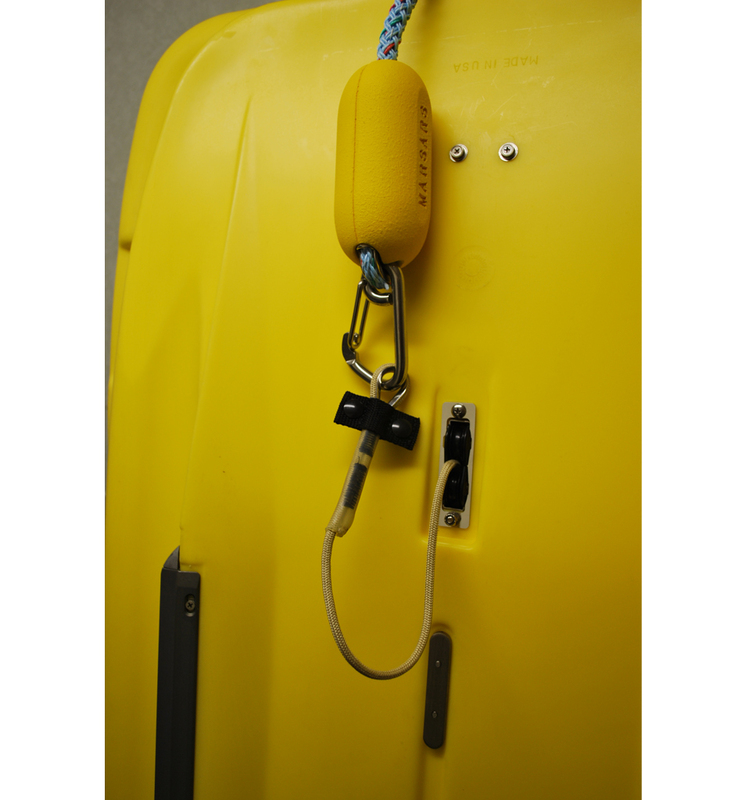 For those seldom if ever life-or-death situation that requires disconnection, a buoyant hook float has been added to keep the disconnected tether hook afloat and ready for re-connection. This tough little sled comes to you pre-rigged, ready for instant use. 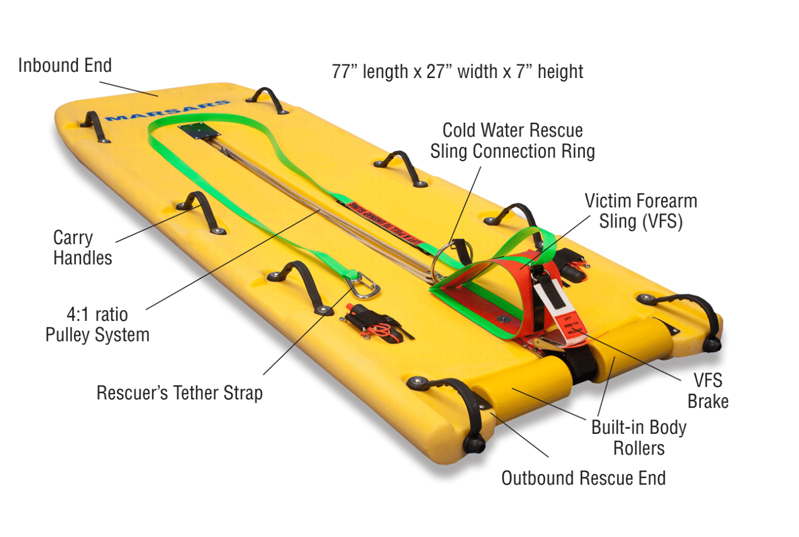 The responding rescuer equipped sled is either dragged behind or traversed atop, obviously, the sled is designed to get you on-scene quickly. In fact, propelled over smooth early winter ice, this lightweight hand powered (by ice awls) sled has been clocked to a speed of 14 miles per hour. Upon arrival on scene, sled is stopped and dismounted one sled length away from the victim. 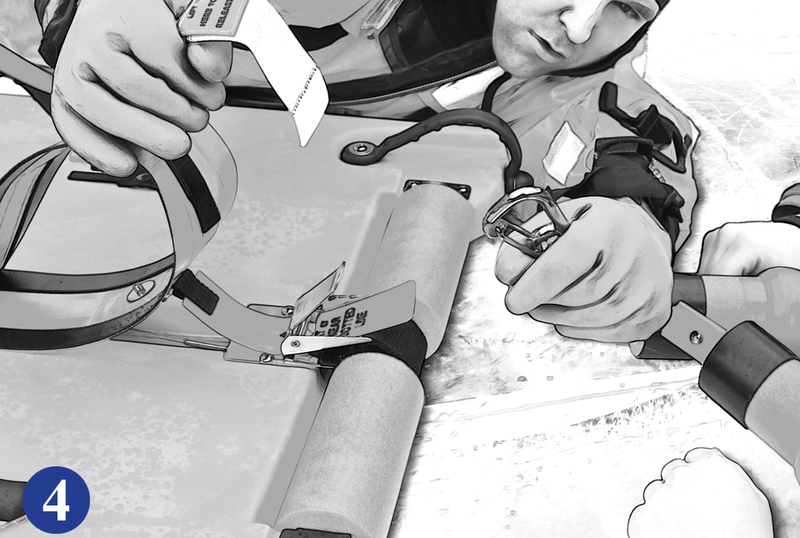 Becoming a reaching device, the empty sled is extended for the victim’s self-rescue attempt. 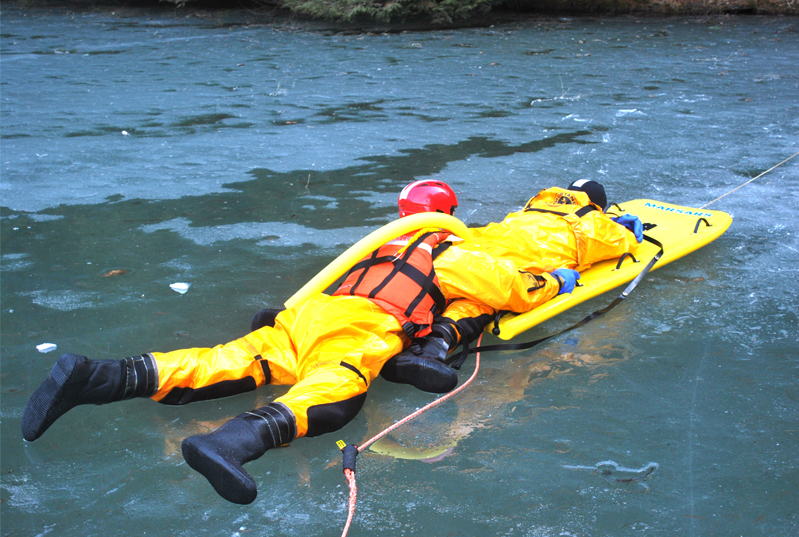 If the cold water immersed victim is found to be drained of strength, the rescuer must move closer and insert the sled between himself and the weakened victim. 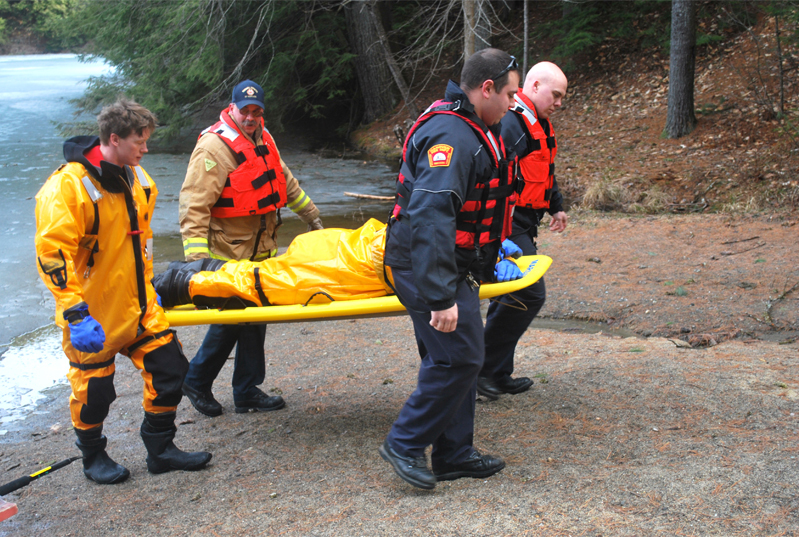 The victim is then outfitted with a buoyant MARSARS Cold Water Rescue Sling that is fastened to the sled’s large topside metal ring. 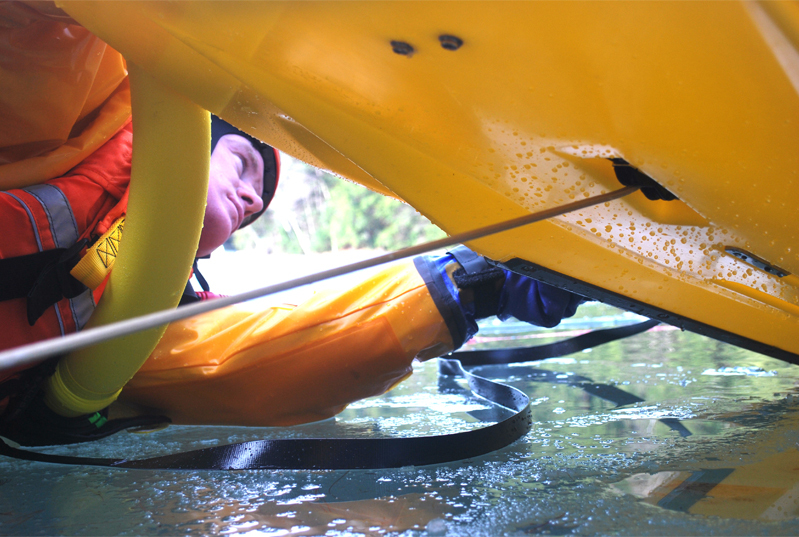 Rescuer pushes one end of the sled underwater and easily loads patient on the partially submerged device. Returning sled shields torsos of both patient and rescuer. 72” length x 24” width x 7” height. Weighs only 25 lbs.